VSA volunteers helped Provincial Hospital technicians gain vital skills in maintaining medical & surgical equipment. organisations into Quy Nhon to formally resume New Zealand's aid effort. A maintenance engineer was assigned to ensuring essential equipment functioned properly in Province Hospital. An ophthalmology program was established at the Leprosarium Hospital, Quy Hoa. Under the auspices of Volunteer Ophthalmic Surgeons Overseas, a team adressed eye deformities caused by leprosy and did cataract operations. LabNZ, based in Christchurch, started programmes retraining staff in the laboratories of the Province and City Hospitals. A surgical team returned for a teaching visit in May 1996 to teach & train in anaesthesia, general surgery, orthopaedics & midwifery/obstetrics. 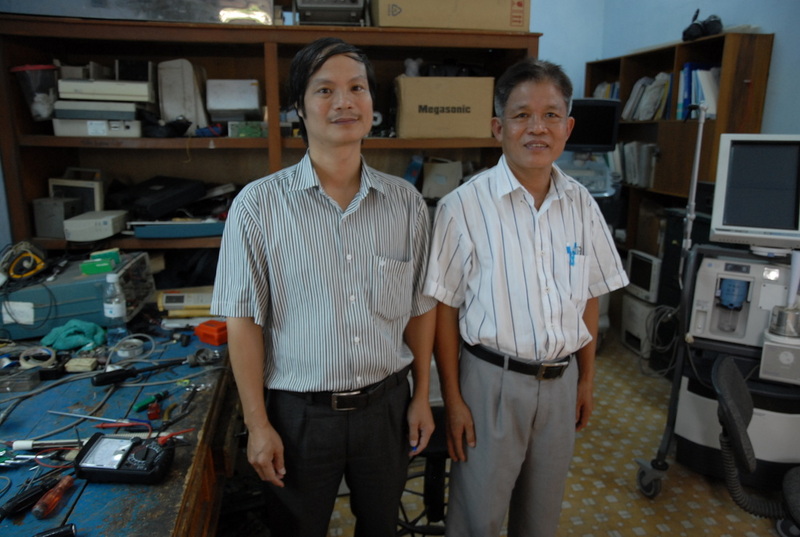 Local Vietnamese trained as interpreters, drivers and administrators to support the VSA team's day-to-day operations. In 1997, the New Zealand Vietnam Health Trust formed to supplement VSA's hands-on commitment with specialised health education and training for Vietnamese practitioners. VSA & NZ | VN Health volunteers worked closely together, sharing resources and supporting one another's work. VSA reluctantly withdrew from Binh Dinh in 2012 after 20 years - also a casualty of changes to Government aid funding. Some VSA volunteers have continued their work through the NZ | VN Health Trust. In the eyes of local Vietnamese, these two agencies formed the united 'Kiwi' front on the ground in Binh Dinh. This is the legacy the New Zealand Vietnam Health Trust is now struggling financially to maintain.